The Fiberglass Manifesto: 12 DAYS - Bozeman Reel Co. X Bozeman Rod Co.
12 DAYS - Bozeman Reel Co. X Bozeman Rod Co. It's certainly been an interesting couple years for small upstart Bozeman Reel Company as they are getting their fly reels into more shops literally around the world and along the way have formed up a couple other sister companies with Bozeman Rod Company and Bozeman Fly Goods which continue to impress with their interesting and outside the box offerings as well. As the 12 Days of Christmas giveaways were approaching, I called Dan Rice of Bozeman Rod Company and asked if they would like to be involved. He countered and upped the ante asking if they could give away a Spring Creek Series 223 fly reel along with a Bozeman Rod Company Paradise Glass fly rod too. Why of course. I have been using several of the Bozeman Reel Company fly reels and the SC Series is certainly a favorite. This little clicker, complete with a classic S-Handle, just purrs so softly. It is a perfect compliment to a trout weight glass fly rod. The Retro Fly engraving on the backside of the SC 223 looks pretty damn sharp too if I say so myself. From the fly rod side of things, Bozeman Rod Company has been busy working out some very special offerings and the Paradise Glass series has a full flex taper which will have you wanting to grab our fly box full of dries and go looking for sippers. 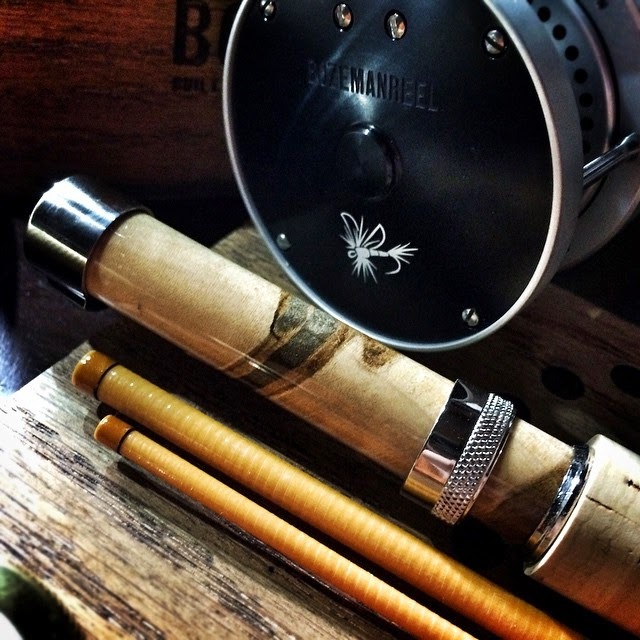 Today Bozeman Reel Co. and Bozeman Rod Co. have joined together to create a perfect outfit with the Bozeman Rod Company 7' three weight Paradise Glass paired with a Bozeman Reel Company Retro Fly edition SC 223 fly reel. This is small stream dry fly fishing perfection that is worth over $1,200 in retail value. Congratulations. This is an unbelievably cool fly rod and reel outfit. Check out the Bozeman Reel Company, Bozeman Rod Company, and Bozeman Fly Goods to see what each company has going on. Make sure you follow each companies social media feeds as well since a lot of new product ideas are first shared there. If you are interested in a SC Series or RS Series with the Retro Fly engraving, please contact Dan Rice at Bozeman Reel Company by email and they'll add this free of charge with your fly reel order through the holidays. Wow, that is an incredible giveaway. Many thanks. A 7' 3wt. Very sweet looking rod. Must be a special production since I could find the paradise series only as a 4wt or 5wt on their hp. Brilliant Xmas gift ! Excellent idea Cameron!! Drats...To quote one of my favorite sports movies, I should have used the live chicken.